I know I haven't been posting regularly. Its only that my baby is small and I don't get much time, though so many things keeps on going on in my head you know.So today finally I thought of doing this tutorial, which I had done a week ago or more. 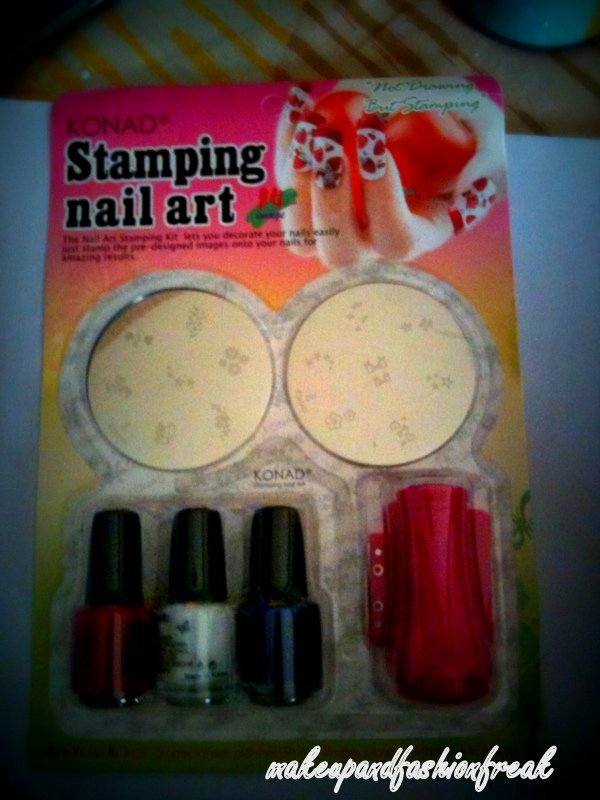 KONAD Stamping Nail Art is a new nail-imprinting kit that lets you put designs by stamping pre-designed images on your nails in minutes. Apply or change designs any time you want, change designs weekly, daily or as many times you want. 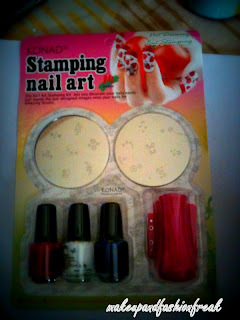 KONAD Stamping Nail Art kit can achieve delicate details never before achieve by hand painting. Do it yourself in just minutes at home, at a friend's house or bring it anywhere you desire. You can put designs not only on you nails but on mobile phone, earrings, pendant, bracelet, gift box, watches, calculators, clocks, sunglasses or any surface of your choice. With KONAD Stamping Nail Art kit you can create perfect, professional nail designs at a fraction of the time and money, just like a professional nail artiste ... or even better. It's neat and easy !!! Clean stamp, scraper and plate with acetone based remover, it may not work if you use non-acetone based remover. When applying special polish to image plate, do it in one thick stroke do not apply multiple thin strokes as the polish on image plate would dried up by the time you finish. When scraping off excess polish from image plate hold scraper at an approximate 30 to 60 degree angle with KONAD word facing the direction you are scraping and do it in a single stroke. After scraping use stamp to pick up the design from image plate by stamping on plate with a little force and in one action do not stamp multiple times. Do this immediately after scraping as the polish on image plate is very thin after scraping and will dry up very quickly. After picking up the image, you can now take some time to position and stamp on your nails. For longer lasting image, apply a base coat or nail colour before stamping any design on nails. Hope I was successful in helping you guys. let me know if any help required. P.S. : a lot of patience and a little practice is required to get the perfect stamping :) & yes stay tuned another nail art tutorial coming up..